So two questions previously asked about vibranium, links below, they both came down to vibranium absorbs kinetic energy, IE absorbing the force. And it seems that way for most vibranium based questions. My questions is, if Captain Americas shield is made from vibranium, how does he hurt people with it? I originally thought it was because his shield was not pure vibranium, but a mix between vibranium and proto-adamantium. But that would only reduce the amount of force it absorb, not take away its ability to do so. In both cases there is no recoil and very little energy transferred. If these are both true, then there is no energy being transferred to his opponents right? My question again slightly refined, how does take down his opponents with his shield, if there is no kinetic energy being transferred? He can deal damage with his shield because it's designed to work as a story element in a comic book. In terms of real physics, it makes no sense. Newton's Third Law says that for every action there is an equal and opposite reaction. This is a pretty fundamental property of how masses interact with each other, and makes this concept fail. The problem is that if we postulate some sort of material that absorbs the kinetic energy, that precludes the shield from imparting kinetic energy upon its target. This is because whatever is going on at the molecular or atomic level to do this absorbtion would also prevent the imparting of energy due to Newton's Third Law. It's perfectly acceptable to me to postulate magical substances in comic books with physically impossible properties. However, there isn't a way to explain this one due to its asymmetric nature, unless the shield somehow "knows" which energy to absorb and which not to. I'm not aware of it being assigned any kind of consciousness, so that's out. You have to keep in mind that Vibranium only absorbs kinetic energy directed into it. If the shield absorbed ALL kinetic energy from any impact, it would be useless as a tool or weapon. Also, Vibranium does not absorb 100% of an impact's kinetic energy, only most of it. Let's speculate! So what you have here is a near-invulnerable object travelling through the air at whatever speed it was thrown. Normally, the only thing that would stop such an object is the outside forces applied against it. In the case of the shield, however, most - but not all - of that outside force is nullified by the properties of the material. Captain America has obviously learned how hard & fast to throw the shield in order to have it impact an object and still bounce back. In fact, his ability to accurately predict the trajectory of the shield is what makes him one of the few people in the Marvel universe who can wield the shield with any sort of effectiveness. In most people's hands, it would be no more effective than a big, near-invincible Frisbee. As for transferal of energy, it actually works the opposite of what you're thinking - the material prevents kinetic energy from being transferred through it, not out of it. For instance, when someone like Thor or The Hulk hits Captain America's shield, any other material would transfer that kinetic energy directly into the Captain's body. At the very least, his arm would be shattered, and after that his legs would probably turn into pulp. However, because of the Vibranium's properties most of that energy is negated, resulting in a much smaller impact as far as the Captain's bones & muscles are concerned. perhaps we can state that the Vibranium is actually re-directing the energy instead of absorbing it. Obviously, a bit of hand-waving is needed here, but we might speculate that - say 80% - of any kinetic force being applied to the shield is reflected away from the shield, or even back upon its source. 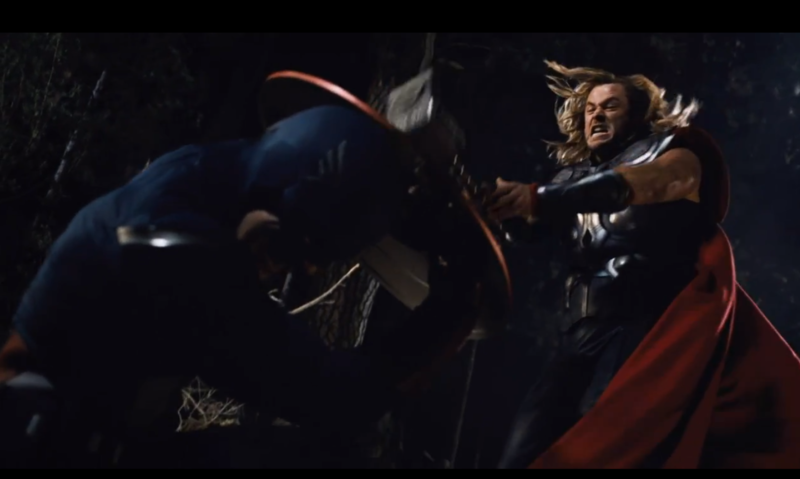 This would be supported by a scenario like in Marvel's "The Avengers", where an attacker (in this case, Thor) is knocked backwards at almost the full force of their OWN blow. However, we would then be forced to explain other scenarios - like that in Captain America: Winter Solder - where an opponent strikes the shield with no obvious effect. We might even go so far as saying that Vibranium is polarized, with one side of the shield having a positive charge and the other having a negative charge. This would attempt to explain why impacts on one side of the shield reflect/re-direct while the other side somehow absorbs/nullifies. However, it's far more likely that both sides react to kinetic energy in the same way. Of course, even with all this in mind... it's also important to keep in mind that applying real-world physics to a comic book will almost always result in frustration. Captain America takes some heavy hits, but he never just stands upright and lets his shield absorb the impact with its magical Vibranium. He braces for impact. If he doesn't brace against something, he gets knocked over like everyone else. Adamantium claws strike the the adamantium-plus (vibranium) sheild with a cascade of sparks. The sudden lunge tips Captain America off balance. The shield doesn't magically absorb blows. Cap' does that. It is strong enough to withstand them. 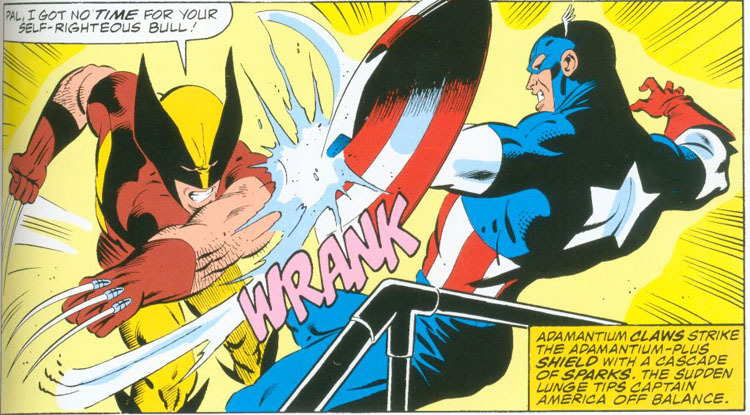 The blow is distributed over a wider area, and Rogers can use his arms and body to more gradually absorb the energy of the punch/strike/explosion and transfer its momentum. That doesn't quite line up with your quote, but that's physics in this universe. And it means that shield makes for a very fine weapon. If the hypothetical Vibranium absorbs kinetic energy, it probably does so in its own frame of reference. In this frame, the target of the shield is coming with great speed towards the shield. Upon impact, the shield somehow absorbs all of the target's kinetic energy, reducing the target's relative velocity (in the shield's frame) to zero. What happened from an observer's perspective? The shield collided with the target, somehow caused the target to match the velocity of the shield upon impact. In the observer's frame of reference, it could be that the shield actually imparted kinetic energy to the target. How can momentum be conserved? It's a textbook example of a purely inelastic ("sticky") collision. The shield is moving, hits its target, and the two move with the same final velocity. The shield would have to have changed its velocity during the impact in order to conserve momentum. How does the shield inflict damage by absorbing kinetic energy? When the shield impacts its target and somehow makes target match its own speed, the new speed of the target may be very different from its original speed. This impact does damage to the target because the target potentially experiences very large accelerations. It's the same kind of damage that a punch delivers: the painful part of a punch isn't usually in the impact, it's in the sudden (whiplashing) change of velocity that results from the impact. If a boxer punches an opponent's teeth and knocks a few teeth out, it's not the impact that knocks them out. The teeth break near their roots, yet the boxer's glove doesn't impact the roots. The impact changes the tooth's velocity, which puts incredible shear stress on the tooth's roots as a result. The tooth, being unable to withstand the shear stress caused by the sudden change in velocity, breaks loose at its weakest point. It might be easier to think of how it works if you consider the limit of the shield having nearly-infinite mass (but Cap somehow is strong enough to wield it). Not the answer you're looking for? Browse other questions tagged marvel marvel-cinematic-universe captain-america vibranium or ask your own question. Can a cage made out of Vibranium contain The Hulk? If one were to have boots made of Vibranium, could one fall from any height? If Captain America is frozen with his shield how come Iron man has it? How does Captain America's vibranium shield bleed off excess energy absorption? What, exactly, is Vibranium able or not able to absorb? Why is Captain America disappointed with SHIELD? Can Superman break Captain America's vibranium shield? Is there any reference where Captain America's shield is made from stolen Wakanda vibranium? Is there a way to Explain how the T'challa's suit absorbs kinetic energy and expels it? Could Antarctic Vibranium destroy Captain America’s shield?